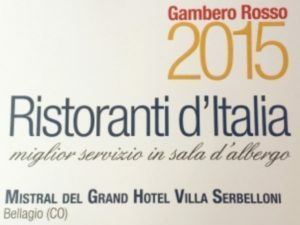 Gambero Rosso has certified Grand Hotel Villa Serbelloni’s Mistral Restaurant’s excellence: Best Front of the House Service and “Two Forks”. Roma, November 17th. 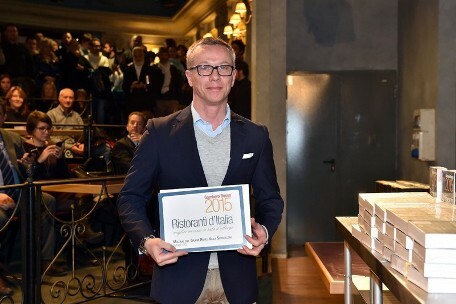 At the presentation of the 2015 Restaurant Guide at Città del Gusto, Gambero Rosso awarded the “Best Maître d’Hôtel” accolade to Carlo Pierato, Manager of Mistral Restaurant. Grand Hotel Villa Serbelloni’s excellent cuisine and front of house service were also confirmed by the “Two Forks” certification and its placement in Gambero Rosso’s general ranking, with a score of 89/100. 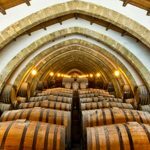 An unmissable destination for gourmet cuisine lovers. Carlo Pierato had been previously named Best Maître d’Hôtel by L’Espresso’s 2014 Guide. Mistral has been a 1-Michelin star restaurant since 2005, thanks to the excellent work of Head Chef Ettore Bocchia, the pioneer of Italian molecular cuisine. And L’Espresso’s 2015 Guide’s award for “Pastry Chef of the Year” went to Mistral’s Manuel Ferrari, who switched from Savory to Sweet with resourcefulness and excellent results. Mistral, located in Bellagio (Como Lake), is Grand Hotel Villa Serbelloni‘s elegant restaurant. Closed for the winter season, it will re-open at the beginning of April 2015 (opening times: lunch and dinner on weekends, dinner only during the week). The restaurant can also be exclusively reserved for events or work meetings. Ettore Bocchia, Head Chef of Mistral, has written an article for Italia Convention outlining the advantages of molecular cuisine, that enhances raw materials and facilitates the process of organizing high-quality lunches and dinners for large numbers of people. Photo: Carlo Pierato with his Best Maître d’Hôtel award.